Jay from Fox Lake asks: After my dear sister eats onions and garlic, she emanates “fumes.” Could this be slowly killing our cat and dog, who are forced to breathe in these nasty vapors when she pets them? Answer: You have almost identified a valid concern, since eating onions and garlic is actually poisonous for cats and dogs. Plus, you can feel comfortable knowing that your analysis is simpatico with that of mariners in “days gone by.” Indeed, there was a time when sailors were flogged for eating onions and garlic, because it was believed fumes from those hearty vegetables could destroy a ship’s compass. Kevin from Bellingham, WA, asks: Your fair city recently achieved national media attention when a baby kangaroo (confined to a baby car seat and attired in diapers and a very cute onesie) visited a Beaver Dam McDonalds. I understand the joey (baby kangaroo) also goes to movies and attends church. This is amazing and makes me really want to visit such a cool city as Beaver Dam. 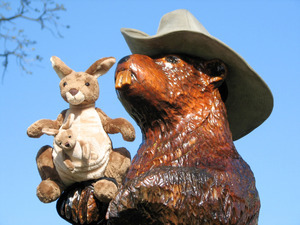 So, did Beaver Dam pull out the welcome mat for the cuddly Australian visitor – did he get a free Hoppy Meal? Answer: No, someone called the police, demanding to have the joey removed. Kevin Asks a Follow-up Question: Well, has the City of Beaver Dam sent an apology to the Australian Embassy for the misunderstanding – explaining that the people of Beaver Dam immensely value our Australian friends? Answer: No, the City passed a law so that only people, dogs, and horses can eat at McDonalds. Kangaroos (and beavers) won’t be allowed inside. Kevin Asks Yet Another Follow-up Question: Do you mean to say that deadly, Nazi German Shepherds and un-diapered, Godless Arabian horses can visit McDonalds, but movie-going, Christian Kangaroos cannot? Answer: That’s what I mean to say. Yikes, Kevin is Loaded with Questions: Have any of these renegade kangaroos ever killed a human? Answer: In 1936, a hunter in South Wales died while trying to break up the fight after his dogs attacked a wild kangaroo. Initially the dogs had the upper hand, but the kangaroo came from down under and the attack boomeranged on the hunter as the kangaroo became hopping mad. (Editor’s note: this is a really sick sentence and the City of Beaver Dam should probably pass a law that outlaws this kind of junk.) In my experience, domesticated kangaroos do not kill people. By contrast, domesticated dogs and horses injure millions of people and kill hundreds of people every single year. Kevin: Jeeeeezzz . . .
Answer: That’s not really a question. Send your questions to: Beav@localeben.com.